In 1961, Murry and Audree Wilson took a weekend trip to Mexico, leaving their teenage sons Dennis, Carl and Brian a couple hundred bucks for groceries. The boys grabbed the cash and used it to rent musical instruments and equipment so they could record a song Brian had just finished writing. "Surfin'" was written by proxy  his more worldly brother, Dennis, filled him in on the details regarding the surf scene, the latest Southern California fad, and Brian turned it into a catchy tune. When the folks returned home and found out about their sons' shenanigans, Murry reacted violently, as was his norm, screaming at Brian, the oldest of the three. Then he reluctantly agreed to listen to the recording. A fledgling musician and songwriter himself, Murry gave the song his professional evaluation: Not Bad. But in a matter of months, "Surfin'" was a local hit. The Beach Boys got signed with Capitol, and were on their way to becoming the chief purveyors of the California Dream. What happened over the next 30-plus years is a fairly well-known tale. After turning out hit after top-ten hit, the '60s King of Pop discovered LSD, and the Beach Boys were never the same. Brian became the definition of a drug-casualty, building a sandbox in his living room and placing his piano in it so he could feel the sand between his toes when writing songs. He also spent the better part of a decade in his pajamas. If music opened up a room in Brian's brain where he could hide from Murry, drugs opened up a whole mansion where Brian could escape the pressures and vicissitudes of life and growing up. By the early '80s, Brian weighed 350 pounds and was smoking half a dozen packs of cigarettes a day. Reluctantly, the Beach Boys gave a disbelieving Brian the pink slip. Worried that he was on the verge of pulling an Elvis, they told Brian that his only hope of re-joining the band was to enter into treatment with Dr. Eugene Landy, a psychiatrist known for his unconventional treatments. Over the next few years, Landy helped to get him off drugs, back in shape, and re-acquainted with the idea of adult responsibility. But Landy also infiltrated every area of the artist's life, moving in with him and even collaborating on the songs that appeared on Brian's first solo album in 1988. The past few years have been a coming-of-age for Brian. Free of Landy, he has recently released a new album, and is about to embark on his first solo tour ever, a major milestone for a musician who has suffered from stage fright since his earliest days. The album, Imagination, is filled with hints about where Brian has been and what he's been through. When Brian phoned, he was friendly and seemed genuinely engaged by questions that called for him to be self-analytical, perhaps a carry-over from all those years of therapy. Occasionally, he seemed to be saying whatever popped into his head just so we could keep moving and get to the end of the interview as soon as possible. But when he spoke about his efforts at giving a go to normal life, it was totally genuine. 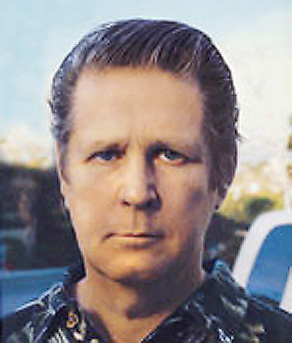 At 56, Brian Wilson, the man who's motto might once have been, "Give Me Childhood or Give Me Death," is finally growing up. CAROLE: When you sit down to write, what's it like? Do you feel like it's an act of will, or do you feel like you're channeling the music? BRIAN: That's what I do. I'm an instrument for God's music, and his music comes down through me. It's been that way ever since I started writing songs in 1961. CAROLE: How has the song writing process changed for you over all these years? BRIAN: The process is the same. I wrote "Surfer Girl" when I was 19, and it's still my favorite song that I ever wrote, but the difference is I used to like to write by myself and now I like to collaborate. You bounce ideas off each other and you can get into better trips when there's someone to do it with. And the other thing is that I've grown, so I'm able to write songs that I wasn't able to write when I was a little kid. CAROLE: I've always felt that the Beach Boys' music captured the spirit of youth better than any other band. So now that you're 56, what do you miss most about being a kid? BRIAN: I miss the thing about not having so much responsibility. I miss that quite a bit. CAROLE: I miss that too, actually! And what do you like best about being an adult? BRIAN: You get to see the overall picture of life a little better, because you've lived a lot of time of life. You can see what's going on. CAROLE: When I listen to early Beach Boys stuff, there seems to be a code of ethics in it, about loyalty and wanting to do the right thing. Is that how you see it? BRIAN: I don't know what the word code means, but I think there's a certain vibration about it that comes through. I think the realness of it comes through. CAROLE: But at the time, were you thinking a lot about right and wrong and being an honorable person? BRIAN: Yeah, I think we're spiritual. I think we gave our lives to God and I think we're a very spiritual group. There's a lot of love in the Beach Boys, you know? CAROLE: Definitely. And God comes up a lot in Beach Boys songs. It's been said that "God Only Knows" was the first pop song to have God in the title. What do you think about God? BRIAN: I think of God as Phil Spector. BRIAN: Yeah. I believe in him and his records. And I learned a lot from him too. Everybody knows I believe in Phil Spector. Everybody knows it. Pet Sounds was P.S.  that's Phil Spector's initials! It was like a way to express his music through me, my interpretation of his music. So it really was a great album. CAROLE: Oh, I love Pet Sounds. BRIAN: There's a lot of love in it. A lot of love went into it. CAROLE: Is there another God besides Phil Spector? BRIAN: Yeah, there is another God that I can't put into words. I call it feelings, or intuitions. I think of music as God too. Not only just Phil Spector, but music itself I think of as God too. CAROLE: Someone told me that Barry Manilow's big hit song, "I am Music," was written about you. BRIAN: Yeah. Bruce Johnson wrote that song about me, he told me he did. CAROLE: Those are some lyrics  "I write the songs that make the whole world sing." That's really quite a tribute. How do you feel about it? BRIAN: I feel honored! Very honored! CAROLE: What do you think makes a good pop song? BRIAN: A good pop song needs a little energy, and it needs a creative push on the melody and, of course, a good vocal. CAROLE: It's amazing how few groups harmonize anymore. BRIAN: I know, vocals are on the way out. I don't think very many people are singing at all. CAROLE: I know that "Little Surfer Girl" is one of your personal favorites. What are your other favorites of the songs you've written? BRIAN: "California Girls." I consider "California Girls" to be our best record. CAROLE: Last night, before I went to bed, I listened to "When I Grow Up to Be a Man," and I was wondering if I could ask you about those questions you sing about in that song? CAROLE: "Will I dig the same things that I did as a kid?" CAROLE: It's a great line! BRIAN: It's a pretty creative line, isn't it? CAROLE: Yeah, to have that foresight! CAROLE: But is it true? I mean, do you still like the same things you did then? BRIAN: Like Rosemary Clooney and Perry Como, stuff like that. CAROLE: And then there's a line, "Will I look back and say I wish I hadn't done what I did?" BRIAN: Ooh, absolutely. I absolutely believe that. BRIAN: Yeah, on a lot of different trips that I did. CAROLE: Can you give me an example? CAROLE: Well, that's something everyone has to go through. CAROLE: Okay, another line: "Will I look for the same things in a woman as I did in a girl?" BRIAN: [Long pause and a big sigh] I don't know. I can't answer that question. CAROLE: Towards the end of the song, you ask, "What will I be?" Do you think you grew up to be who you wanted to be? BRIAN: Yeah, I did. It took me a while to grow up but I grew up. I had a second childhood that I went through that got me squared away with life. CAROLE: I think a lot of people who had painful childhoods have to have a second one. I'm just coming out of mine. BRIAN: I know, it's a tough one. You have to unlearn things that you didn't want to learn. You have to unlearn being certain ways, and it's kind of tough to do that. But you can do it, 'cause you have the willpower. CAROLE: And you should feel happy that you hung in there, because it does sound as if you've come out of it. BRIAN: Yeah, I have. The song "Happy Days" on my new album is all about that, and how I went through the hell and the confusion. All the sound in the beginning sounds real confusing, and then each step goes better and better, and finally it climaxes with "Happy days are here again, the sky above is clear again." Well, you know, you've heard it. That's about me. CAROLE: Is that how you feel, like the clouds have parted? BRIAN: Yeah, I do feel that in my heart. CAROLE: When I think about a song like "In My Room," it's obvious that someone who had a happy childhood couldn't have written that. BRIAN: Yeah, I know. I know! CAROLE: Do you think that your music helped heal you? CAROLE: That's right, you have two little babies. BRIAN: Oh, yeah. Daria, she'll be two years old, and we have a nine-month-old named Delanie. She's a gorgeous baby. In my previous marriage I had two babies, too, but now they're all grown up. So now I have a whole new way to look at babies. CAROLE: Besides making music, how do you spend your time nowadays? BRIAN: Well, I exercise and I do some thinking and I play the piano a lot and I go places and do things. I watch a little television, but just to stay in touch with life. Because I don't like television. I don't know what it is that I don't like, but I don't like it. CAROLE: What do you watch? BRIAN: MTV and AMC ÷ the Movie Channel. I try to understand some of the movies they have. And I get scared a lot, that's another thing. BRIAN: I don't know ... Dying. I just get scared feelings and stuff like that. CAROLE: It must be particularly hard for you since your brother Carl died recently, and you lost your mother not that long ago, too. BRIAN: It's been tough for me, you know? When I heard about his death it really shook me up, it really did. And it shook Mike Love up too. He feels pretty bad about Carl. The Beach Boys lost one of their best singers. CAROLE: Listening to your new record, Imagination, I wonder how you would explain the difference between your sound and the Beach Boys' sound? BRIAN: The only difference is that I sang all the background parts myself, so for that reason it didn't sound exactly like the Beach Boys. CAROLE: Does it take some of the fun out of it, not having other voices to harmonize with? BRIAN: No, I like it this way. I like doing all the parts myself. You can get a tighter harmonic sound. It works. CAROLE: You used to have a reputation for spending hours and hours on one song. Do you still work that way? BRIAN: No, actually, I don't wallow in the mire so much. When I do my songs, I do 'em and I get 'em done and I put them behind me. I don't hang out with one song as much as I used to. I sort of go on to new plateaus. CAROLE: Is there any current music you listen to? BRIAN: I listen to Phil Spector's records and I watch MTV a lot. CAROLE: Has anyone caught your attention? BRIAN: What's that guy's name? Steven Tyler of Aerosmith. I like him a lot. Stuff like that. CAROLE: Where do you think you fit into the current music world? BRIAN: Adult contemporary. I think I'm a force in adult contemporary music. I think I'm a force. CAROLE: I know that you were influenced by the Beatles and that they were definitely very influenced by you. Can you imagine how your career would have gone if there had been no Beatles? BRIAN: No, I can't. Not at all. They put us on the map almost. They gave us an inspiration to make music. CAROLE: Two of your early influences were Chuck Berry and Little Richard. Do you still listen to them? BRIAN: I don't still listen to them, but I still think about them. I think the R&B people, were the real pioneers of rock 'n' roll. People don't recognize that much, but it's really the truth. Most of your really good music in the '50s was Black music, and it's amazing what they did. They were innovators. CAROLE: Are there particular songs that you like? BRIAN: Well, "Sweet Little Sixteen" was how I got "Surfing USA." I redid the song to a new kind of a lyric and it was a smash hit. CAROLE: This may sound a little obscure, but do you ever feel an affinity with Michael Jackson? BRIAN: Yeah, I do. I actually do have that feeling about him. CAROLE: I just say that because he played in a band with his brothers, he's very musically talented, and he had a very painful family upbringing, particularly his relationship with his father. BRIAN: Yeah, there are a lot of parallels between him and me. CAROLE: And there's a tender, fragile side to him that I also see in you. BRIAN: I know, he's a very very fragile person, but he's got this energy and this great dancing style. CAROLE: If you could give him a special message, what would it be? BRIAN: I'd say, "Welcome on to the bandwagon. Our music is for you!" CAROLE: A lot of your songs talk about home. Do you feel like you've found a home? BRIAN: Yeah, I think we've found our way back home now. That's a good idea, you know ... found home, found our way back home. That's true. CAROLE: What is home for you? BRIAN: Home is when where you are is right for you. I'm finally getting used to the house I live in L.A. I didn't like it for a couple years, but now I'm getting to like it. Starting to get used to it. CAROLE: Do you think you're a person who will always have a sense of loneliness inside you? BRIAN: Yeah, I feel that way a lot. CAROLE: Is that okay with you? Is it something you've gotten used to? CAROLE: Is there anything that you do that makes it better? CAROLE: Is there anything you want to say to your fans? BRIAN: Yeah, thank you very much for being loyal to me, and I promise a good rock and roll album in the future.